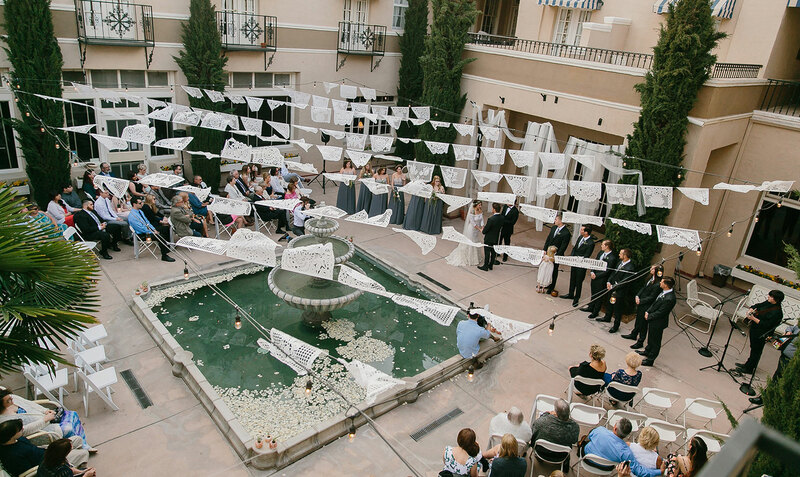 The Hotel Paisano is the perfect spot to hold your dream wedding ceremony, reception and wedding events, family and other celebratory events. The Hotel Ballroom with seating for up to 100 people and offering a view of the swimming pool complete with glowing lights and a flowing waterfall. Perfect for ceremonies, seated dinners and buffets, the ballroom will also serve as a dance floor with the accompaniment of live or recorded music. The Central Courtyard with tiered fountain, overhead lights and entrances to the hotel’s lobby and restaurant. A beautiful setting for outdoor ceremonies, cocktail parties, dinner and dancing. Pop-up bars and buffets can be arranged through Jett’s Grill, exclusive caterer for events on-site . Musical performers are always welcome. The Sun Porch overlooking the pool is perfect for a small cocktail hour or intimate dinner. The Fireplace Lounge, a cozy sitting area situated between the lobby and ballroom and adjacent to Jett’s Grill, has hosted marriage ceremonies as well as various types of receptions. For more information or to check availability, please contact the hotel manager.